We like to learn from living role models and marketing books. Famous figures of the past are equally inspiring, and the principles for success almost timeless…. 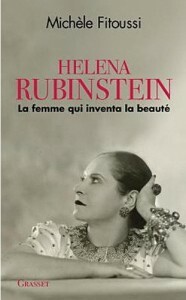 An adventurous entrepreneur, Helena Rubinstein: I recently read Michèle Fitoussi’s Helena Rubinstein: La femme qui inventa la beauté (The woman who invented beauty, Grasset 2010), a new biography of the woman behind one of the original cream and cosmetics mega-corporations. Rubinstein, born in a Jewish ghetto of Krakow in 1872, was not a likely candidate for fame and riches. Her father was a generally unsuccessful shopkeeper more interested in the Good Book than his accountability books. As a woman, Helena’s main pre-ordained purpose was to marry young and as well as possible (the fact that she was the eldest of eight girls, all of whom would need dowries, made getting her married off a particularly pressing matter for her parents). However, the stubborn and intelligent bit of a woman (standing at only 4’10”) would have none of the potential suitors – she wanted her own life, and a life far more glamorous than her Orthodox neighborhood could offer her. In her early twenties, she took a ship to Australia, where she would work for one of her expatriated uncles in Coleraine, in Western Victoria. (Her parents, presumably, could only shrug off this far-flung exile as their unmarried daughter’s earned lot). The conditions were rough, and particularly for the rather dainty Helena, who was only accustomed to city living. However, she was also an avid worker, and not content to remain forever stranded among rough men and herds of sheep. It would take her several years to find, but she did finally hit upon her exit strategy – to develop and sell a face cream to Australian ladies eager to remedy their sun- and wind-damaged skins. The art of living and breathing marketing: Here are the beginnings of an international corporate empire They are humble and quasi-accidental, which is the case of so many of the major brands that shaped the twentieth century. Helena Rubinstein’s start-up had all the right factors for success: a good idea with good timing, obsessive amounts of work from its founder, and brilliant positioning. What is so engrossing about this entrepreneurial saga is how much Rubinstein consciously and carefully created her brand and her image. She lied, or rather, she re-arranged facts, beautifying reality. She was certainly not the first or last to do this, but she did it with a keen sense of consumer demands and needs. She not only sold the benefits of her creams and, later, cosmetics, but her entire persona as well, letting herself become in people’s minds a glamorous woman of wealthy, perhaps noble origins. When she launched Velaze, her first cream, she positioned it as the recipe of a world-famous European doctor containing exotic ingredients. She purposefully overpriced her product, recognizing that women wanted to buy luxury. She established a salon where she enticed journalists to come try her skincare line. In short, Helena Rubinstein, from the very beginning, lived and breathed marketing. Find something worth selling that people actually want to buy. Devote yourself to formulating a product that can compete against others. Know what your consumers want so that you can market to them specifically and successfully. Always be ready to adapt to evolving needs and trends. The fact that so many brands that have become institutions today followed a similar structure and growth pattern is no surprise: no matter the period or the product, the bases of human interest and interaction remain the same. More about the author, Michèle Fitoussi (in French).